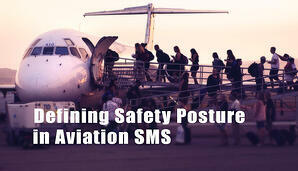 Safety posture in SMS is largely about how you define acceptable level of safety. Different organizations will tolerate different levels of risk. Some aviation service providers will accept much risk, other service providers have almost no tolerance beyond minimal risk. Adopt the approach that is justified and reasonable given the history of risk in your niche of aviation service. If your aviation service niche has a strong history of safety incidents, you should consider adopting a paranoid posture. If your goals and history are in line with a promiscuous posture, then perhaps that is the way to go. Most likely, you will fall somewhere between paranoid and promiscuous. History of risk in your organization/type of service. A charter helicopter company, for example, will likely accept much more risk than a Part 135 airline. Document risk assessment on each hazard/risk in your hazard register (this helps you understand what types of risks are of concern to your organization). Having a well-documented safety posture means clearly understanding the relationship between certain actions/risks, and how your organization does/doesn’t respond. Your organization clearly and thoroughly documents that stance. Has enough history to assess past performance. If your SMS is young, not implemented, or doesn’t have needed resources, then having the right safety posture should be the least of your concerns. Is your SMS performing well? Are you avoiding repeat safety incidents? Are you avoiding significant negative trends? Whether or not you should be enforcing a more paranoid posture regarding what risk assessments are acceptable. Then, let some time pass (i.e., 6 months or a year) and re-evaluate to see how performance has changed.